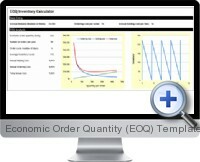 The Economic Order Quantity (EOQ) template for Excel conducts analysis on inventory levels based on detailed inventory and order flow information. The Excel EOQ template automatically updates an inventory analysis report with charts to quickly analyze and identify risks where inventory levels are suboptimal. The economic order quantity analysis allows making ordering decisions to reduce the costs of holding excess inventory and mitigate missed opportunities where demand outstrips supply. The simple layout of the template allows quickly entering or linking in data from external sources to analyze inventory levels and costs. The detailed EOQ analysis facilitates business decision making by displaying critical supply chain information broken down by ordering costs, ordering size lots, holding and carrying costs, inventory cycle time and schedules as well as total cost. Inventory source information required is minimized to number of units of demand or sold, ordering costs and holding costs. The economic order quantity analysis provides an intuitive report with key metrics and charts to be able to make corrective action decision for inventory cost and risk reduction. The Excel EOQ template is provided as a compatible solution for all version of Excel.